Who is Responsible for Financial Oversight? For many organizations, an area where they struggle is in their financial oversight. While many executive directors watch the finances closely, far too many boards simply rubber stamp the financial reports when they are submitted for review. While the board does not need to know every single expenditure (and honestly, this can become quite tedious), they do need to know how expenses are tracking against the budget. They also need to know if the finances are a concern. 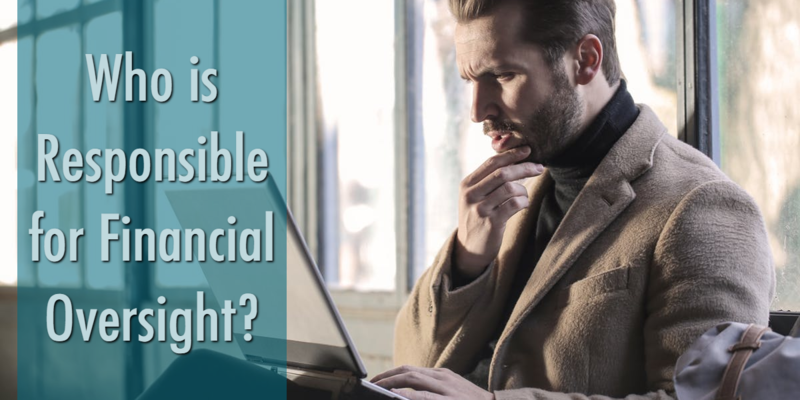 It is also a good idea for the board treasurer to have access to Quickbooks and or the bank statements so that they can review both incoming revenue and outgoing expenses. This simple act can ensure that there are no misappropriations of funds. While many nonprofit leaders do not relish the idea of developing financial statements, they are a must! So that the organization may meets its legal requirements, complete financial statements are necessary. They are also necessary for the board of directors so that they can provide oversight of the finances and make strategic decisions based on the information contained within. It is recommended by accountants that all organizations use Generally Accepted Accounting Principles (GAAP) in the management of their finances. It is important to note, even if the board does not meet on a monthly basis, they should be reviewing the finances monthly. Since the board is ultimately responsible for the organization’s finances and since the IRS has placed the public’s trust in the hands of the board of directors, it is important that they understand the finances. Unfortunately, reading the financials is an area where many board members feel inadequate. Take some time each year to provide an overview of the financials – what to look for, etc. Nonprofits should also plan to have an external auditor (i.e., accountant) audit the finances of the organization on an annual basis. Smaller organizations may not need a full audit, but instead should have a financial review. The purpose of both an audit and financial review is to ensure that the financial resources of the organization are being used appropriately. It should also be noted that many foundations require either an audit or review to be considered for grant funding. Another function of the board of directors is to develop policies and procedures related to finances. Such policies may include who has permission to make spending decisions and at what threshold as well as how funds will be invested. Written policies should dictate the day-to-day management of receiving money and spending it. Occasionally, a board member may come to the organization seeking a loan for personal reasons. This is never a good practice and should be avoided. While not illegal in all states, many states do have laws against this practice. Every organization should have a board-approved annual budget. It is important to have the Executive Director be included in the development of the budget as he/she will be responsible for implementation of programs and services; however, it is ultimately the responsibility of the board to ensure the organization has the resources it needs to fulfill its mission and to approve the budget. Does your organization have written financial policies? Now may be the time to develop them. We can help you get started. Feel free to contact us. Previous: Previous post: Do Policies Protect? Next: Next post: Which Hat Are You Wearing?